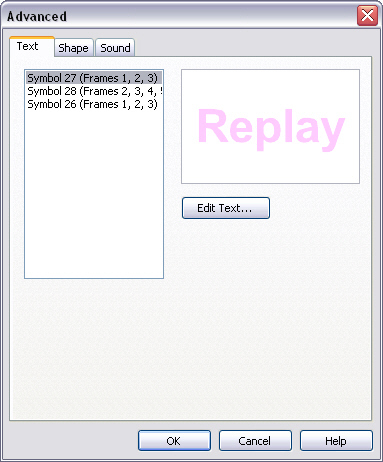 When you select dynamic background or greeting card, which are in fact movie clip, or button, the button Advanced under tab Properties of its Properties panel will be usable. If you want to edit advanced settings of the movie clip selected, you may click button Advanced and dialog Advanced appears. If the selected button or movie clip contains text(s), you may edit the text(s) under tab Text in the dialog Advanced. Select one text listed in the left panel, and then you will see the preview of the text showing in the right panel. Click button Edit Text to open dialog Edit Text and do the editing. After editing, click OK to finish your advanced setting. If the selected button or movie clip contains shape(s), you may edit or replace the shape(s) under tab Shape in the dialog Advanced. Select one shape listed in the left panel, and then you will see the preview of the shape showing in the right panel. Click the Edit Shape button to edit fill or line of the selected shape in dialog Edit Shape. Click the Replace Shape button to select another shape in dialog Select Shape dialog to replace the current one. If the selected button or movie clip contains sound(s), you may edit or replace the sound(s) under tab Sound in the dialog Advanced. Select one sound listed in the left panel, and click one of the three buttons on the right to do some editing. Click the button to play the selected sound. Click the button to select another sound file in dialog Select Sound to replace the current sound. Click the button to remove the sound.